The SCOTTS® SYNC™ System Cordless Lithium-Ion Hedge Trimmer is the perfect addition to all of your SCOTTS® lawn care products. The innovative charging station allows the user to charge the battery on the tool or alone like a traditional charger. The wall mounting charger doubles as a hanger for the tool; no more excuses for an unorganized workspace. Powered by the SCOTTS® 20V, 2.0 Amp Hour battery, this hedge trimmer is prepared to complete your pruning needs. The dual action blades coupled with 2400 strokes per minute will trim your hedges faster and cleaner with less vibration. 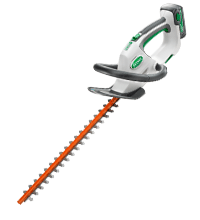 Backed by a 3-year warranty, the SCOTTS® SYNC™ System Hedge Trimmer is engineered for performance and durability. Cut Capacity: Up to 3/8"